Welcome to the Mitsubishi Encyclopedia (Mitsipedia). The site stated out in 2005 as a site dedicated to the Mitsubishi Magna built in Australia from 1985 to 2005 but work is in progress to cover most Australian market Mitsubishi vehicles. 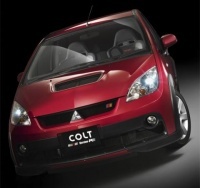 The seventh generation Mitsubishi Colt was the second Colt to be released on the Australian market. It was released in Japan in 2003, with a European release in 2004. It hit the Australian market in August 2004, designated as the RG model. The Colt has been released in 5 door hatch and 2 door cabriolet body styles. Hatchbacks are imported from Japan while the Cabriolet is imported from Italy. 1997 Mitsubishi Verada Xi It all started off with a 1997 verada Ei, plans were soon made to playing around with it, stereo was in, alpine head unit, alpine front splits, 2 v-power amps, and 3 12" subs innthe boot. just got the lowered springs put in, and the wheels were on there way. then one quiet morning on the way to work, all hell broke loose, hitting a guard rail at 120kph and flipping the car. This page was last modified on 17 November 2013, at 00:03.